Straight from the homepage I was pleasantly surprised by JackpotCity Casino. The casino welcomed me to the Big City of jackpots; I could see tall skyscrapers lit up at night time which gave me the feeling that I’m visiting Las Vegas but from the comfort of my home. However, I had to check some facts first before signing up a new player account. I could see that JackpotCity Casino has been online since 1998 and it has withstood the test of time; it is still attractive, keeps things fresh and offers the best of safety and security. The casino is operated by Digimedia Ltd and it offers games form the online casino software pioneer Microgaming. With many years of experience, excellent management and high quality software I knew I would have safe, fun and entertaining gaming experience at this casino. So I immediately signed up and went to the lobby to check the games. I have to point out that the biggest reason why I like to play at online casinos is because of blackjack. Blackjack is my favorite casino game based both on luck and skill and it has one of the lowest house edges of all casino games. I might not be a blackjack pro, but I do like to experiment when playing blackjack, try new playing strategies as well as play many blackjack variants. I was glad that JackpotCity Casino offers a great deal of blackjack games from Microgaming. This means that I have wide blackjack gaming choice and the games are of crisp and colorful graphics and have excellent sound. Some of the blackjack games I came across were Multi Vegas Downtown, Double Exposure Blackjack Gold, European Blackjack Redeal Gold, Vegas Single Deck, High Streak Blackjack, Multi-hand Blackjack, Spanish Blackjack, Big Five Blackjack and a dozen more. All in all, I could count more than 20 different blackjack games and I knew immediately that I’ll spend the entire day and night playing the games. The Gold Series blackjack games were definitely my favorite. I really liked the realistic graphics and enhanced game play. They made me forget that I’m playing online and not in an actual casino. I was also happy to see that I could play Triple 7’s Blackjack, which is an excellent and fun progressive jackpot blackjack game from Microgaming. 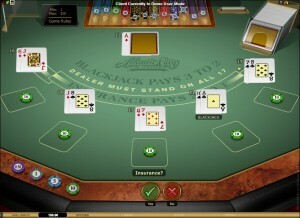 Live Dealer Blackjack is also available for play. 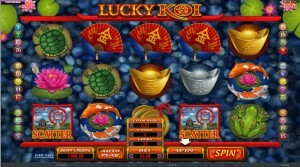 Besides various blackjack games, JackpotCity Casino offers plenty of other virtual casino games categorized into classic, video and progressive jackpot slots like Lucky Koi, So Many Monsters, Secret Santa etc; video pokers like All Aces, Double Bonus, Aces and Faces and so on; table games like Red Dog, European Roulette, Baccarat, Craps, Spingo and many more; about 20 progressive jackpots like Cash Splash, Mega Moolah and Treasure Nile as well as a couple of casual and instant win games like Electro Bingo, Mayan Bingo, Flip Card, Keno etc. The game choice is pretty large and if you are looking for a specific Microgaming title, you will definitely find it here. In addition, you can check most of the games for free which is great. There aren’t any blackjack only bonuses at JackpotCity Casino, but the welcome bonus offer can be used to boost your initial bankroll and play blackjack games. The casino gives 100% welcome match bonus up to $200 on your first deposit to play various casino games. Before they can cash out their winnings, players must meet the 50 times wagering requirement, which I think is pretty high for a welcome bonus. Nevertheless, you can play many casino games with it. All blackjack games count 10% toward meeting the wagering requirement, with the exception of Classic Blackjack that counts only 2%. The casino also gives 100% bonus back on your second deposit up to $300 which is nice. I also noticed that the well-tailored bonus program at JackpotCity Casino is comprised of other daily, weekly and monthly promotions that give special rewards to players ranging from cash, casino bonus and free spins to cool gadgets, holiday vacations to exotic lands and five star cruises. There are also regular midweek and weekend match bonuses based on player’ activity of the preceding weeks. Regular players also gather loyalty points that can be exchanged for real cash, while VIPs get special VIP rewards and treatment. 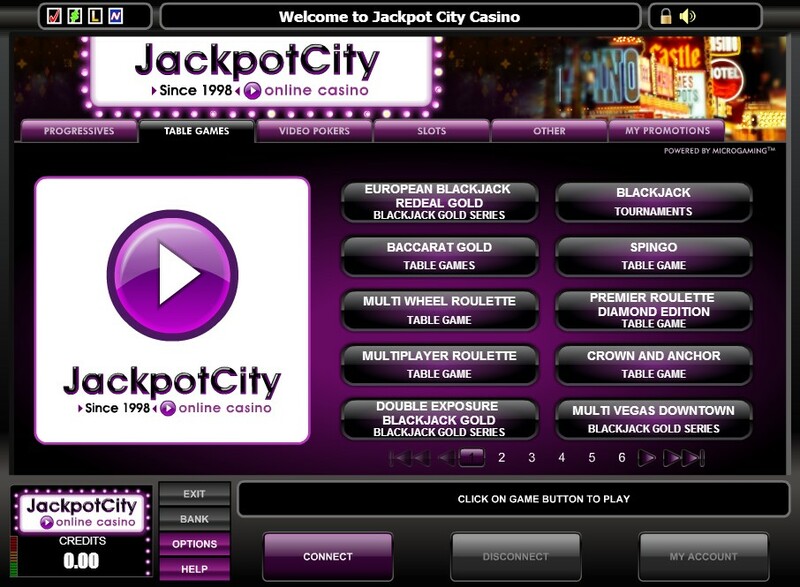 JackpotCity Casino is available in instant play and players don’t need to download any software to play the games, especially Mac users. The casino is also compatible with various mobile devices like smart phones and tablets that are running on iOS, Blackberry OS and Android mobile operating systems. I have HTC One running on Android and I could easily access the casino and the blackjack games directly on my phone. 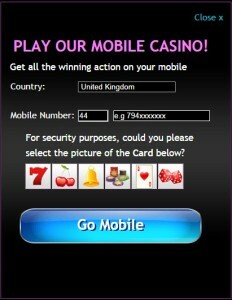 To play mobile casino games, visit the Mobile tab and enter your country of residence and phone number. 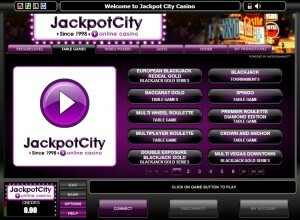 JackpotCity Casino claims that it offers safe and easy deposits and super fast cashouts. Visa, MasterCard, UKash and Neteller are the deposit methods available, while to make a withdrawal you can use Visa, MasterCard and Neteller. Deposits are immediately processed and without any fees, while withdrawals are available within 48 hours, depending on the cashout option you have chosen and so are the fees associated with withdrawing. From what I saw JackpotCity Casino is a reputable, well-established, safe and trustworthy online casino powered by Microgaming that offers wide selection of online casino games as well as mobile games and live dealers. I really liked the large blackjack library and the fact that the games are eCOGRA certified and fair to play. Banking is also seamless. They offer live support 24/7, but it’s all telephone and there’s no onlne chat support. Some information is a little hard to find on site too, so having online support with be handy. Despite being around since 1998, the jury is still out on JackpotCity Casino.